This quartet was one of the few pieces of occasional music for which Schubert was specially commissioned and paid, and its background is an interesting, if rather obscure one. We only know something about it through the testimony of Gerhard von Breuning (the son of Beethoven’s friend Stefan von Breuning) who was told the story by Anna Fröhlich, one of Schubert’s friends and responsible for encouraging the composer to write a number partsongs for female voices from about 1821. Anna Fröhlich was a piano teacher at the Conservatorium, but she also taught privately at the home of one Baroness Geymüller. It was the baroness who was particularly keen to have a poem set to music in honour of a friend named Ritter who had recently recovered from a serious illness. Fröhlich had never met Herr Ritter and had no idea who he was, and neither do we to this day. Fröhlich promised to ask Schubert on Barbara von Geymüller’s behalf if he would undertake the task. He did so, composed it apparently on a single day, and received fifty Gulden for his trouble. 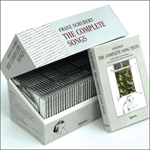 Fröhlich told Breuning the composer was delighted with the money. The piece no doubt received its first performance to the delight of Herr Ritter (again, we do not know when), and it surfaced only in 1842 as Des Tages Weihe, with new words suitable for a name-day or birthday celebration. It was probably the ever-interfering Anton Diabelli who had adapted the text to make it more suitable for commercial consumption (people had birthdays more often than recoveries from serious illnesses, particularly in unhealthy Vienna). Strictly speaking, then, the title of this piece should be Schicksalslenker, blicke nieder (as in a recently issued volume of the Neue Schubert Ausgabe), but the work has long been known under its first published title. This is a beautiful, if not over-characteristic, piece of occasional music. At least we know that the composer was not responsible for the choice of text with its slightly mawkish religious overtones. The key is A flat which Schubert also chose for his much greater four-part song Gebet (1824). In Schubert’s output the worship of God (Im Abendrot) and Zeus (Ganymed) are linked by this tonality. 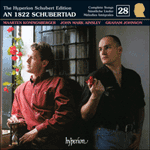 This disc thus begins and ends in A flat major, and there may be some argument to say that Schubert regarded the sexual rituals of Versunken and Geheimes (both songs in this same key) as another sort of worship. The piece starts with a gentle and mellifluous solo for the bass, the piano accompaniment suggestive of string accompaniment with pizzicato lower strings. After fifteen bars we hear all four voices (SATB) together for the first time, and the accompaniment breaks into semiquavers. The part-writing for the voices is particularly effective, a gentle sound of wafting harmony exactly right for a song about recovering from illness. For the great moment of God revealing himself (‘Durch die Nebel strahlt der Glanz’) the music shifts into C flat major, an almost obligatory progression in those A flat songs by Schubert where there is a moment of sensual magic or epiphany (in Ganymed the youth lies languishing on the breast of Zeus in C flat major). At ‘Liebevoll nahmst du der Leiden’ there is a short tenor solo before the four-part texture re-establishes itself. A recapitulation of the main tune is marked ‘Mit halber Stimme’ and, in the mezza voce form, strikes the ear as the most restorative of balms. The final setting of ‘Schicksalslenker … blicke nieder … Auf dein dankerfülltes Herz’ dies away in solemn augmentation. For a one-off commission Schubert should be congratulated for taking the trouble to write a beautifully turned miniature cantata, somewhat conservative in style (no doubt to fit the musical tastes of his employers) but nevertheless containing many a turn of phrase which could only have come from his hand. The only tragedy and irony is that as the composer sat down to write a piece about the happy cure of Herr Ritter, his own appalling health problem, the syphilis which was to change his life for ever, was about to emerge; indeed it was certainly only a matter of weeks before he would notice the first symptoms. Only then would the anonymous lines about a ‘bitter cup of sorrows’ have struck him as the most terrible of prophecies. If Elizabeth McKay’s theory that the illness was already well advanced by December 1822 is correct, the irony is stronger still. Und das Leid, es ist vergessen. as if from a brilliant wreath of stars. was made known far and wide.